This page has been written for the use of doctoral students nearing completion of their studies and seeking their first postdoctoral employment. It is also useful reading for doctoral students in earlier stages of their studies, because it is not too early to think about how to prepare for the various types of employment available. We use the term postdoctoral employment literally - meaning your first job after earning a PhD in mathematics. As you progress through your doctoral studies, it is natural and appropriate for you to think about your future. It is unlikely that you will begin to think about this too early, but we caution you not to begin too late! Many postdoctoral research jobs are awarded early in the spring semester to commence the following fall. These jobs may have early deadlines for application in the fall of your final year of graduate study. Also, the type of job for which you intend to apply may influence your choice of activities long before graduation, including research conferences, paper presentations, and other valuable preparatory experiences. You should discuss your plans for your future with your dissertation adviser, who will help you think about your options, including a postdoctoral research job, which may be at a university or in a laboratory or industry, or a primarily undergraduate teaching position. Your adviser knows your interests, abilities and potential better than any other faculty member, so you and your adviser should discuss these matters frequently and frankly. One of the important considerations is this: there are more opportunities to move from a postdoctoral research job to a primarily undergraduate teaching job than vice versa. Moreover, the better undergraduate colleges do want faculty members who conduct research. Such college faculty members are more likely to place the graduates of their college into good graduate programs. Unless you are in the unusual position of having a desirable job already guaranteed to you in advance, some general advice applies. The ease of application with modern electronics has resulted in very large numbers of applications for each job. In order to protect yourself in this environment, you must apply for many jobs - surely at least one hundred. You should apply for a range of jobs, from the best job of your dreams to least you could accept. Do not limit yourself unnecessarily at the outset. Try to start with broad horizons. Be willing to consider many geographical locations as well as types and levels of institutions to which you apply. You can always turn down an offer - but if you don't apply widely and often you will not know the range of your opportunities. We urge you to apply early, and we wish you quick success. But you must not become discouraged. Depending on varying conditions which are hard to predict, you may need to be patient. Many jobs, including some very good ones, are awarded late in the spring, and even in the summer, to begin in the fall. Perseverance in the quest for a job is likely to be rewarded. an online electronic service specifically for mathjobs. the American Mathematical Society's site for employment information. the Mathematical Association of America's site for current listings of mathematical jobs. Tips for the Job Search - from the AMS Notices. List of Universities agreeing to AMS policy on deadlines for decisions on accepting a Postdoctoral Research Job. This article was written for mechanical engineering students at Urbana-Champaign, but it has much generally valuable advice. The links above will help you locate and make contact with prospective employers - including especially college and university mathematics departments. But you need to consult closely with your adviser as well. For example, your adviser will know which mathematics departments are most likely to hire a candidate with your specialized interests. And if you are an applied mathematics student, there may be departments or institutes other than mathematics departments which also hire mathematics PhDs with your preparation. Your adviser will be your best resource for guidance in this. Each application for a job must have several essential components, and we have gathered advice for you here about these items. Every job application includes the applicant's vita. This is a structured summary of your academic career and mathematical experiences. It includes also information about you and about how to reach you which a prospective employer needs to know. The Department has prepared a LaTeX template which you can fill out with your own information. This template, and the Instructions version of it which includes many comments and footnotes, is intended to show you what a Vita should be and to suggest the types of items you can include and where to include them. If you are applying for a postdoctoral research job, you will understand the great importance of your Research Statement. Even if you are applying for an undergraduate teaching job, your research statement is an important part of your application. It would be a rare college that does not want its faculty members to have published their dissertation research and to have ongoing research. Your continued research and scholarly activity can keep you intellectually stimulated and up-to-date in your field of expertise, even decades after completing the PhD. Writing a Research Statement is a valuable activity in itself. It can help you to see yourself and your own interests and work in a larger mathematical context. It will require you to think about how your dissertation research fits into mathematics in a broader sense. Your statement should address the following questions. What mathematics gave rise to the problems you have studied, and gave them their significance? What did your research contribute to those problems? Are there further problems in your dissertation research program which you plan to investigate in the short-term future? How would you like to see your research grow in the future? It is important that your plans be based on sound foundations which give you a legitimate basis to hope you can progress towards your stated goals. In other words, do not make rash claims in your statement of plans for future research, but do try to fit your interests and objectives into a realistic vision of how your field of mathematics is growing and how your plans fit into this vision. Especially if you are applying for a postdoctoral research job, you need to consider that senior mathematicians appraise an applicant's research by both productivity and originality. The level of originality is subjective, which makes it the harder of these two characteristics to judge. To a graduate student, it may seem that every new theorem, once proven, is after all an original contribution to mathematics. Although this is true, it is also the case that some questions and their pending answers are perceived by experts as being in the air. It is likely that your dissertation research question emerged from some other mathematicians' prior research. If those other mathematicians tried seriously to solve the problem on which you have succeeded, they will see your work as original. If you used techniques or approaches not common to your specialty, this also contributes to the level of perceived originality. If your result is surprising or unanticipated, or if it disproves what had been commonly anticipated, this will cause many experts to read it with interest and there will be more reason to see your work as highly original. If your adviser sees your work as highly original, he or she may suggest that you submit a paper to a prestigious journal. Such journals have a reputation for publishing papers that meet very high standards of originality. If you are seeking a postdoctoral research job, or if you are not ready to be graduated and are planning to seek a postdoctoral research job in the future, there are practical steps for improving your prospects. Build a strong foundation for an expanding and broadening career in research. Read extensively in your field of specialization and contiguous areas. Attend and participate in research conferences. Attend and participate in relevant MSRI Summer Programs. Make contact with off-campus experts in your field of specialization. If your adviser thinks it will be good for your research, consider a Research Semester off-campus. When your adviser tells you that your research is ready for publication, do it - but not before! Here is a link with Advice on How to Submit a Paper for Publication. If you have a formal preprint, approved by your adviser, consider including a copy with your job applications. Although many of the copies may go unread, it takes only one member of one hiring committee to dip into it, get interested, and decide to recommend that his department hire you. Finally, you have heard the famous adage that necessity is the mother of invention. So also your own felt need to understand a part of mathematics in a way which is most meaningful to you can give rise to your own originality and creativity. Answering your own inner thirst for understanding can make your contributions uniquely yours, and that is a rewarding experience. Thinking about these matters while writing your own Research Statement can help you to develop an improved sense of perspective and meaning in your own life as a mathematician. In case you would like your stationery for your Research Statement to be in the same style as your vita, we provide here a fresh template for you to download for this purpose. 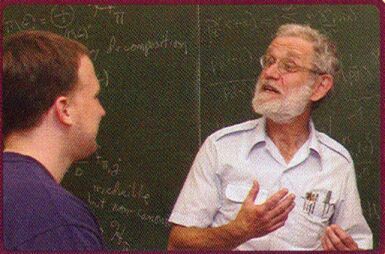 Professor Oxley has served as Faculty Mentor for most of the Department's teaching assistants for many years. He has written letters of recommendation for many PhD graduates about their teaching experiences and abilities. He has explained below what you should think about as you begin to write your own Teaching Statement. Be sure to download and read his letter to you about this vital component of your application. Here is a fresh template for you to use if you would like your stationery for your Teaching Statement to be in the same style as your vita. Even if you are applying for a postdoctoral research job, your Teaching Statement is an important part of your application. Each university prefers to have faculty members who will do a fine job of teaching its students. And your ability to express mathematics well, both orally and in writing, will help you to communicate and generate interest in your research. If you are applying for jobs in industry or in a scientific laboratory, you will be applying for jobs which carry a title such as Senior Engineer or Research Scientist. Do not discount the importance of your Teaching Statement when applying for such a job. Two-way communication will be a vital element of your work as a member of a scientific or engineering team. You will need to be able to find out from your non-mathematician colleagues what their needs really are. You will have to translate their questions into valid mathematical problems and find good mathematical concepts and tools with which to help them. And you will need to be able to explain this mathematics to the other members of your team. Being a good teacher and a good expositor will help you in that work. Your statement of teaching philosophy reflects how you understand your role in communicating what you have learned about mathematics to others. This task, at all mathematical levels, will be an important part of your work. You will need to have at least three letters of recommendation. Before asking for letters of recommendation, write your Vita, Research Statement and Teaching Statement as discussed above. Then give your drafts of these documents to each of the professors who will write letters for you. You may get very valuable feedback from them which can help you to make improvements. The letters may be the most important component of your application. They should be written by professors who have first-hand knowledge of your work. One letter should be written by your dissertation adviser, and one letter should be about your teaching. If you have had direct communication about your research with a senior researcher at another institution, ask your adviser whether or not it would be appropriate to request an additional letter of recommendation from that person. Such an outside letter can be particularly helpful in securing a competitive postdoctoral research job. It can be beneficial to have more than three letters - for example, four or five - provided the letters are favorable. Remember that letters of recommendation are considered confidential. It would be poor form to try to tell your professors what they should write, or to ask to see their letters. The custom of confidentiality is very strongly held. On the other hand, most professors do not want to write a negative letter on behalf of a student. If you ask a professor to write a letter and he or she seems hesitant, you should probably consider this a polite suggestion that you ask someone else. If you are not sure what such a response means, you may consult with your own dissertation adviser about this. Or, if you feel able to handle a possible no for an answer, you can ask a professor directly whether or not his or her letter will be a helpful or positive factor in your application. Remember that your letters of recommendation will be read very closely by your prospective employer. We have left the first item for last. Even if some or most of the items of your application are being submitted through the online service called MathJobs, it remains customary to write a letter to the employer from whom you seek a job. This letter should introduce you briefly as a pending PhD graduate who did dissertation research with Professor X at Louisiana State University. It should name succinctly the area of your specialization. Anything you can add which clarifies why you would especially like to work for that particular employer, rather than some other, may contribute to that prospective employer's interest in you. You should ask your dissertation adviser and other suitable faculty members to read what you have written for all the items of your application. Their advice can help you. And please do check your grammar, spelling, and the quality of your writing. You do want your application to present you favorably. Finally, we add one more remark. Your teachers wish you the very best in your emerging career as a mathematician. They are always glad to hear from you and to learn about the events in your life and work. A convenient way to make contact may be the Department's online Alumni Guest Book.